I had to learn how to make lady fingers. I love this little cookie and I use so many in numerous dessert recipes. I simply cannot buy them any longer. They might be available in larger cities but I have found it very difficult to buy any. Most countries have their own version and name for what we call “lady fingers”. Having originated in Duchy of Savoy, the original name is Savoiardi meaning “the biscuits”. They are called the sponges in Spain, sponge fingers in United Kingdom and Australia, boudoir biscuits in France, spoon cookies in Germany, baby sponge cakes in Hungary, Serbia and Slovania. Many other countries have a similar version by different names. 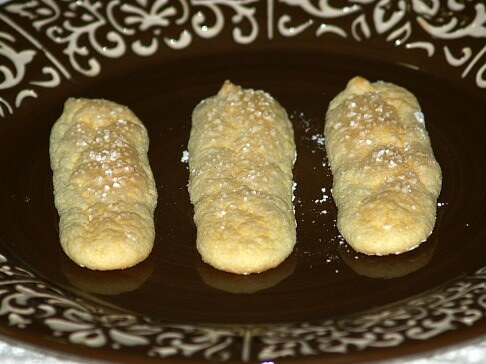 Ladyfingers originated in the late 15th century at the Court of Savoy. So what and where is the Court of Savoy? Back then this was a state in Northern Italy. Today, some of this area is now a part of France. These cookies were created specifically for a visit by the King of France. Later they were given the name Savoiardi and recognized as an "official" court biscuit. They were particularly appreciated by the young members of the court and offered to visitors as a symbol of the local cuisine. I do not know why more people do not learn how to make lady fingers. Since they were brought to the area around New Orleans by early French settlers, the popularity has never slowed in growth. Now this cookie is famous all over the United States. Commercial bakers started making them very early in 1900, but I have not been able to purchase any for quite a few years. They are not hard to make; actually they are pretty easy and they bake quickly. I am always amazed at how many of my recipes require this cookie in the making. I make lady fingers by the “bunch” and place them in the freezer. If you need quick dessert, you can put one together fast with no baking by using this cookie. 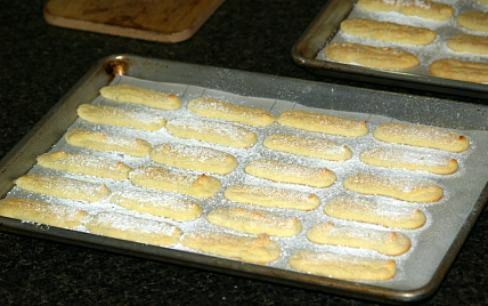 Because I find them a necessary ingredient for many of my desserts I had to learn how to make lady fingers. They are also very tasty and a great cookie to serve with coffee and tea. Homemade ones are much more flavorful than the ones which I have had made commercially. Made with a sponge cake batter, like other sponge cakes, they usually require no leavening in the recipe. They become light and airy by the beating and whipping of the eggs. Usually the recipe will consist of a little more flour than most sponge cakes. This additional flour is what helps the cookies to hold their shape better. Below I have given you my favorite recipes. This is my favorite because it does hold its shape better and has a very good flavor. Of course, the brand of vanilla you choose to use has a lot to do with the resulting flavor. I also liked the results I got by sifting powdered sugar over the cookies before I baked them. The reason for this was to get a soft crust but I think it also helped with holding the shape and the extra sweetness made them extra yummy. . If you are new at learning how to make lady fingers, here are a few things which I learned to be very important. First, do not try making them when the humidity is high. When I cook, I always keep the air setting on low. Even with this, sometimes the humidity is still too high for whipping the egg whites. Less humid days are always better. Make sure your eggs are not too old and not fresher than three days. Most of us do not worry about having eggs which are too fresh but if you have your own chickens, you might overlook this problem. You will want to separate the eggs while cold and then let the whites set at room temperature for thirty minutes before beating. Another tip is to be prepared to work quickly once you have prepared the batter for lady fingers. Prepare your baking pans first. I like to draw the lines on the back of parchment paper to the size I want the cookies. Then I place the lines down facing the pan. If you do the lines with a black marker, it is easy to see the lines through the paper. This makes the cookies more uniform in size. I like to measure out all my ingredients before I start mixing but this is especially true if you choose to dust with powdered sugar before baking. 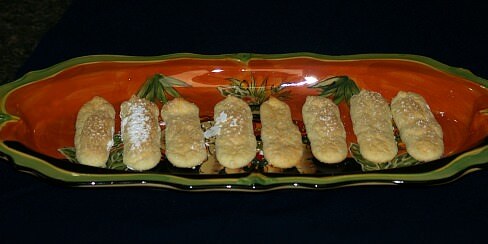 Learn how to make lady fingers with my favorite recipe. I use these in many of my favorite dessert recipes. NOTE: I do not have a ¾ inch tip (I do not know why!) so I used a bag with the coupler and no tip. The hole in the coupler was the perfect size so I cut the bag to fit it. NOTE: If you want your lady fingers more uniform, draw a pattern on the parchment paper for the size. Then turn over so the ink faces the baking sheet. 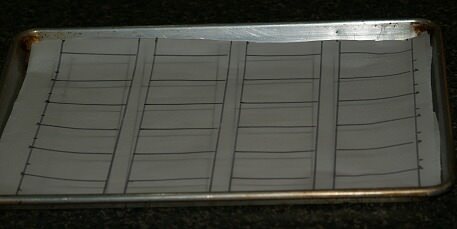 Preheat oven to 400F degrees; line baking trays with parchment paper. Beat egg yolks until light in color; gradually add ½ cup of sugar beating on high until very thick. Add vanilla and continue beating on high about 30 seconds; sift flour over yolk mixture and set aside. In another large mixing bowl beat the egg whites until foamy adding the cream of tartar. Gradually beat in the remaining ¼ cup of sugar; continue beating until whites are very stiff. Spoon about a third of the whites into the yolk mixture; fold in until flour is blended. Add remaining whites and gently fold in. Spoon some of the batter into the pastry bag. Pipe onto the lined baking sheets leaving space between making cookies 3 inches by 1 ½ inches wide. Dust with powdered sugar; after a few seconds you can dust a second time for a pearled effect if desired. Continue until all batter is used; bake 8 to 10 minutes. NOTE: Cookies should still be very light with almost no browning. OPTIONS: Learn how to make lady fingers in different flavors. For CHOCOLATE omit vanilla and sift 1 tablespoon of cocoa powder with flour. For ORANGE omit vanilla and add 1 tablespoon finely grated orange peel to egg yolk mixture. For ALMOND flavor omit vanilla and add ¼ teaspoon almond extract to the yolk mixture. Butter 3 baking sheets, line with wax paper butter again and dust with flour. Put egg yolks and 1/3 cup sugar in the top of a double boiler; partly fill bottom with hot water. Set double boiler over low heat; beat mixture with hand mixer or whisk until very thick and pale yellow. Remove from heat and pour mixture into a large bowl; add vanilla and fold in sifted flour and set aside. In another bowl beat whites until they stand in stiff peaks; fold a large spoonful into the yolk mixture. Carefully fold remaining whites into mixture; spoon some of batter into pastry bag with ½ inch round tip. Pipe 4 inch long strips onto baking sheets leaving about 2 inches between them. Dust strips with superfine sugar; bake until lightly browned about 15 minutes. With spatula lift cookies to rack to cool.